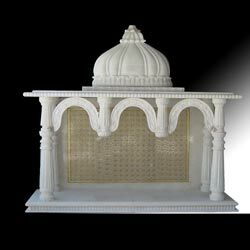 Backed by a team of expert professionals, we are involved in offering broad range of Marble Temples that is praised for its attributes like attractive patterns, durability and reliability. 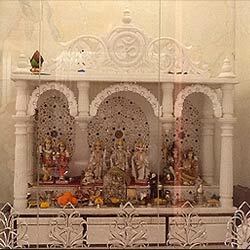 These temples are used in various homes, office, hotels and restaurants to keep gods idol. Our valued Customers can avail this range in various designs, shapes and sizes as per their requirements and within the affordable price bracket. To maintain the quality factors in this range, we make use of the finest quality white marble that is sourced from the reliable vendors. 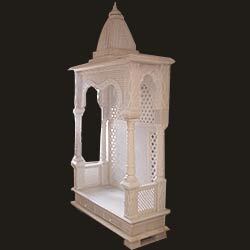 This temple creates a religious atmosphere of timeless elegance for your home surroundings. 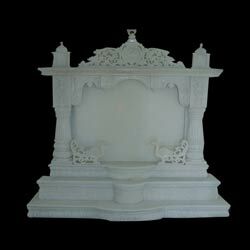 Aesthetically carved on makrana white marble with peacock patterns on the back, these temples gives a sophisticated look to your religious place. 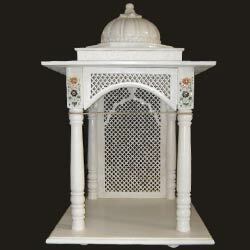 This elegant makrana white marble temple is carved in great detail coupled with two steps. The irresistible beauty of these temples depicts the purity and stunning looks which makes these temples an elegant masterpiece for your home. Net design at the back combined with natural makrana white marble makes these temples look elegant and beautiful. Delicate artistry show cases the charms of marble temples that never fade. This sophisticated makrana white marble temple is decorated with inlay work carvings of criss-cross patterns and classic acanthus to leave a lasting sense of elegance. Beautiful white marble is the perfect demonstration for the rich artistic detail of this magnificent temple piece. 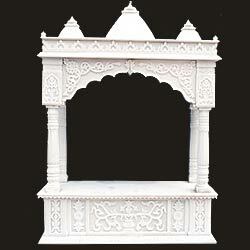 Markrana white marble and impressive in form, this temple creates a religious environment at your places. Combined with 24k gold work at the back of the temple makes this temple a perfect master piece for flaunting your sophistication and elegance. 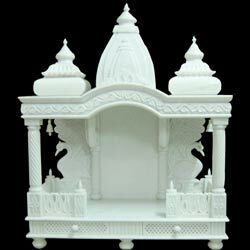 This exquisite piece of temple is carved on makrana white marble and engraved with numerous artistic drawings on it. The temple is detailed with intricate design and gives your spiritual place a magnificent and sophisticated look. This makrana white marble temple designed using inlay with semiprecious stones is truly one of a kind. Skillfully and meticulously detailed with exceptional care, this piece features a magnificent display of a temple masterpiece.